You're supposed to decide many months in advance to run in an upcoming marathon. It had been in the back of my mind (way back, I assure you), but I only seriously thought about it for a couple of months and decided in less than three weeks! Having just completed a 4 hour canyon dash, I was in shape from that point of view. But hiking, no matter how far the distance, is not running! I had done quite a bit of running (at least for me) to help prepare for the canyon, but my weekly mileage was about 26 miles. My longest single run was only a mere 14 miles. If you've read anything about the minimum training suggested before a marathon attempt, you'll know my training was woefully inadequate. What I had going was my tenacity (regularly going to my bodies limit and continuing on) and the single minded thought that if it was either now or never. As measly as 26 miles per week really was, I honestly never thought I'd be at that level again. There are many guides that state you should be at 25 miles a week before you start your marathon training! Any amount of logic applied to this shows the ridiculous inadequacy of this figure. 26 miles in one week and now I'm going to try that same distance in 4-5 hours? Read more on the journey of serendipity. TIP After you've built your running to 25 miles a week or more, this is the point where you're supposed to decide to start your marathon training. 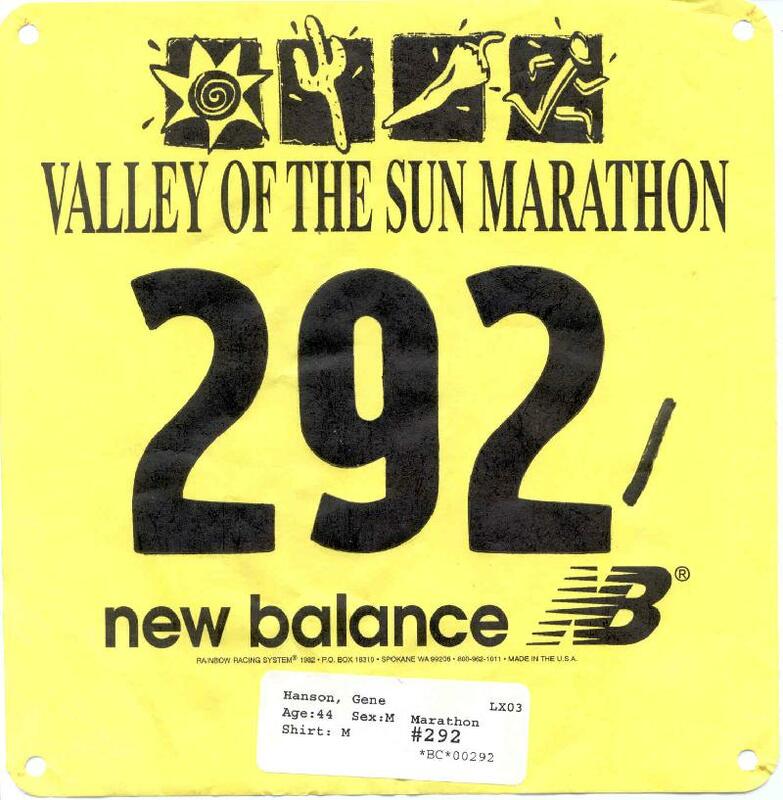 The convenient event was the 2003 Valley of the Sun Marathon in Mesa, just outside Phoenix, Arizona. On the Wednesday before the race, I signed up for the full marathon via the internet. If I decided to not go through with it there would be a price tag associated - $70. Hmmm... Paying $70 for the opportunity to absolutely torture yourself? Is this not the action of a masochist?? If not, then definitely a crazy person because a sane one bent on running would have gone for just the half marathon, a distance I thought I could easily finish. But is it just me, or does doing half of anything sound like underachievement? Because this Phoenix area marathon is run in early March, Spring temperatures could be in full force so they start the event at the break of daylight which is at 6:30AM. The theory is the race will be over before it gets too hot. Ideal marathon weather is overcast with temperatures not exceeding 60 degrees. The necessity of an early start plus the size of most marathons mean same day registration and/or packet pickup is impractical. Instead almost all marathons use the day before to take care of this important aspect of the event. 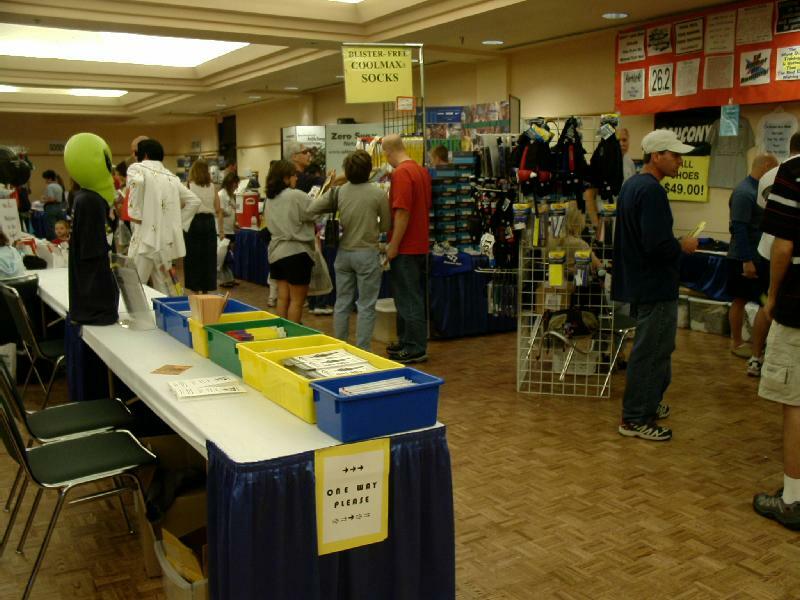 It's called the Expo because in addition to the packet pickup, there are various sponsors and other vendors set up hawking their wares including bottled water, power bars, power drinks, shoes, clothing, fanny packs, etc. That Saturday morning I had french toast for breakfast in order to start building up my carbohydrates for the race. I had never worried about what I ate before, but from the limited information I read fueling the body was paramount. I was to meet Ron and Nicole at 12:00 where the three of us (Nicole would be running in the half marathon) would go to the Expo to pick up our packets and then drive the marathon course to get a feeling for the run the next morning. It hit me as I was driving there when I reached for the air-conditioning button in my car. It's warm! Beautifully clear, sunny, and warm! This was not a good sign for a marathon. TIP It is a good idea to drive the marathon course. The expo was as I expected. One full room was set aside with tables for registering. There were lines for the marathon, half-marathon, marathon relay, 5k, and wheelchair marathon. The half-marathon line was divided by last names A-L and M-Z, but the marathon only had the one sign; an indication that far fewer people were signed up. And you literally had to sign because it was the waiver indicating that you are in fact crazy and clearing them of all responsibility. I didn't mind. My limited legal knowledge tells me your signature doesn't mean a thing if you're insane. 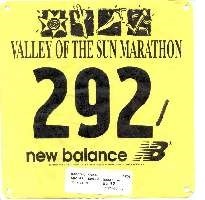 ;) They then gave me the two items necessary for the race: your bib (mine was #292) and your chip. Everyone knows what the bib is all about. You attach it to the front of your shirt with 4 safety pins and you have instant identification. Why the front? Studies must show that when runners keel over, they lie face up. But the chip is a relatively new phenomenon to racing. If you're familiar with a proximity device like a security card, it's really the same thing. The chip is very small, lightweight and is contained within a quarter size piece of plastic you attach to your shoelaces with plastic ties. At designated points of the race (like the start, finish, and key points in between) you run over a red carpet that has sensors that will register your chip along with the time. The last station in registration is to verify your chip. I handed it to a guy behind a laptop computer who proceed to run it across a pad and then asked, "Are you Gene Hanson?" Once you have one of these bibs, wear it on a very long training run. Near the end of when you're tired, sweaty (i.e., you look like hell) flag down someone saying you're running the Boston Marathon and you seem to have gotten off course. Enter any marathon and you get a bag of goodies filled with samples and coupons from sponsors. You also get a marathon tee shirt with the logo of the event and the list of sponsors. We got a white tee shirt with long sleeves that had a disconcerting resemblance to a straightjacket! My theory: they want the participants to receive familiar clothing. 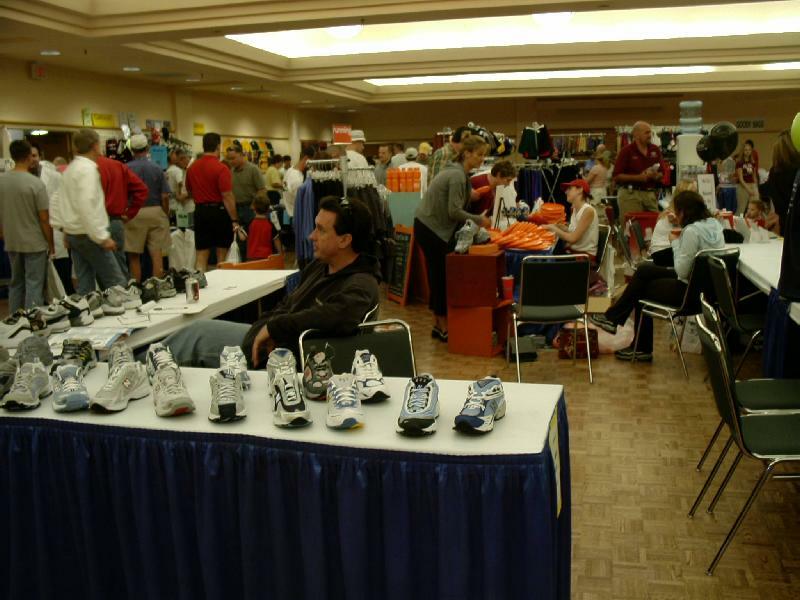 Though we spent less than 20 minutes at the various booths, I found myself curiously attracted to the various vendors who were hawking shoes, run clothing of all kinds, fanny packs, power bars, power drinks, etc. Do I need any of this stuff? Hey, I've got shoes but I don't have shoes like these! Can these power bars be as wonderfully energetic as they claim, or are my fig newtons (my choice of power bar food) just kryptonite in disguise? I reluctantly left without a single purchase now anxious to see the actual marathon course. To continue on to Page 3, hit NEXT.